← Can you help me find a book? When I learned that Heather Wright had put together a writing guide for pre-teens, I asked for a review copy. Hoping there would be tips even I could pick up, I wasn’t disappointed. When I was a pre-teen or teenager I could have benefited from this book, as will any young writers now. Writing Fiction: A Guide for Pre-Teens is well-planned, covering everything a young writer needs to know to give them a sound foundation. It is easy to follow, enjoyable to read, informative, helpful, educational and challenging in a fun and encouraging way. What do I need to be a writer? Pantser or Plotter: Which are You? Where do I get ideas for stories? How do I start my story? Who should tell the story? How do I describe my characters? How do I describe the setting? How do I write dialogue? How do I end my story? How do I make my writing better? What do I do when a story gets stuck? The author ends with a section called Last Words in which she invites readers to visit her website and ask any questions they may have, or share with her a paragraph or two of their stories. 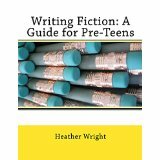 Writing Fiction: A Guide for Pre-Teens by Heather Wright is an excellent teaching aid for young writers. I suspect that if you are a writer – no matter your age – reading the headings above you found something that caught your interest. Why not add this helpful writing guide to your collection of writing books? You can find Writing Fiction: A Guide for Pre-Teens on my BUY THE BOOK! page. As a bonus for you I am including a link to Laura Best’s blog so you can read the very interesting guest post by Heather Wright. This entry was posted in Preambles to Writing, Reviews & Interviews, Writing and tagged becoming a writer, Book review, Canadian author, Heather Wright, learning how to write fiction, learning to write, writing fiction, writing fiction guide for pre-teens, young writers. Bookmark the permalink. Sounds excellent! Thanks for bringing it to our attention.